Unfortunately, your database is not included in the log. It can happen when your database is bigger than 20MB, can confirm it? Are you able to send me it directly to email: bohacma@gmail.com ? The database is situated in "Internal Storage/MediaMonkey/files/mmstore.db"
Unfortunately, the database is malformed and I cannot open it. I have tried to recover it, but it also failed. This can be the last step and you can lose some metadata such as Rating, Album Artists (which is not supported by Android Media scanner), so wifi sync is preferable. To be sure to have understood : when i have an issue, i should do all these tasks : uninstall MMA, delete MediaMonkey folders, delete music data folders, reinstall MMA, start a new fresh wifi sync ? I have tried all situation to get the best answer, but in all cases, repetition of wifi-sync was enough. Also when I uninstalled MMA, deleted all MMA folders, then Artworks were missing until wifi-sync. At first do you have in MMW Options/Portable Device Sync/Your device profile/Options/Tagging enabled "Sync all Artwork to file folders" "albumart"? No it isn't, but i think MMA read albumart in tags, isn't it ? I think i always unchecked "sync all artwork to file folder" because i believed i don't need them. but in this case, when you uninstall MMA, then all Artworks are deleted. Does the albumart.jpg exist in folder where e.g "1.22.03.Acoustic (Maroon 5)" is placed? I have a folder.jpg file in folder where "1.22.03.Acoustic (Maroon 5)" is placed on my PC, but not on my android device. Do i need it ? No, the option is disabled, so artwork should be stored in App folder. 1) Go to MMA Developer Options (Options/About MediaMonkey/tap to MediaMonkey icon) and click on "Publish database to main storage"
2) Send me your database again. I hope it will be not malformed. You can ask in MMW forum. MMW gold (with extensions : Album Art Tagger, CustomFieldsTagger, Discogs Tagger, French translation, GenreFinder, Last.fm Scrobbler, MusicBrainz Tagger, MusicIPTagger, RegExpFind and Replace, Tagging inconsistencies) on desktop PC with OS Windows 7 64-bit SP1, MB Gigabyte M68M-S2P (Socket M2), CPU AMD Phenom II X6 1035T, RAM 4.00 Go Canal-Double DDR2 @ 401 MHz, SSD 111GB KINGSTON SV300S37A12 (C:), DVDWRITER HL-DT-ST DVD-RAM GH22NP20 ATA Device, VIRTUAL ELBY CLONEDRIVE CdRom Device. MMA on 4 Android devices. Great, database is ok now. Tha album "1.22.03.Acoustic" has artwork situated in folder "C4DA-8116:Android/data/com.ventismedia.android.mediamonkey/files/artworks/liav9n4nig5i.jpg", can you verify (e.g by Es File Explorer) whether file really exists? Only in this case wifi sync does not fix it, because it thinks that track has artwork. To fix it you have to delete album(e.g via in MMA/Albums view delete context action) and then run wifi sync again. if this will not work, it's weird, then you can try delete album again and before next sync try to enable "Sync all Artwork to file folders" "albumart" in MMW. Yes it exist but it seems corrupted : it has 120x120 resolution's and 2,1 Ko size's, just like most of others artworks ! What is the need of these artworks located in C4DA-8116:Android/data/com.ventismedia.android.mediamonkey/files/artworks/ ? MMA should use tag artworks, isn't it ? Are they used for "album view" ? I ever did that yesterday and it didn't helped but i just tried again : same issue. 3-I played tracks : artwork is displayed for all tracks of the album in nowplaying list and player view , but not in "album view"
7-I checked if a new artwork file is linked to the album in Android/data/com.ventismedia.android.mediamonkey/files/artworks/ : yes, it is a new one named rsl3tyavtv79.jpg and surprise : it is a 120x120 2,1 ko like others "no goods". What do you think ? Could my sd card be corrupted or do you think it is something else ? I think i didn't have to sync artwork to file folders because MMA could display tag artwork; but you shown me the Android/data/com.ventismedia.android.mediamonkey/files/artworks/ and now i understand that all artworks are extracted anyway ? So what is the best recommandation for performance and speed process : check "Sync all Artwork to file folders" in MMW or uncheck it and let MMA extract artwork itself ? To clarify MMA don't use own Tag parser (It's planned to future version). So if you include some folder to library, then Android media scanner is used. 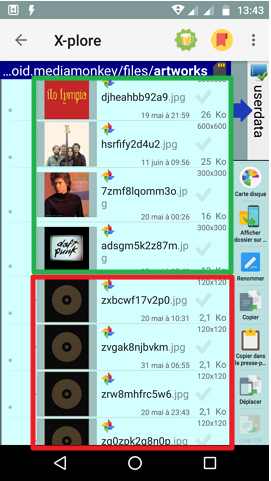 Android media scanner extract artworks to "Android/data/com.android.providers.media/" folder. I think it works well, I guess that old artwork for Album view was cached, so this is the reason why it appears correctly only in other views. If you use Wifi sync, then artworks are downloaded to "Android/data/com.ventismedia.android.mediamonkey" or to the folder where is track located (depends on MMW settings). It looks like MMW default artwork. I will ask MMW guy. Hi, which MMW version do you use? Could you look at the file in MMW and see whether the artwork is shown correctly in MMW? Is the artwork stored in file tag or file folder in MMW? Is it in PNG format? We have updated PNG library recently so there could be some issues. It would be valuable if you could zip the album folder (PC location in MMW) and upload it somewhere (Box, DropBox, FileDropper, ...) for me to test , replicate and possible fix the issue? Yes, all artworks are displayed for all my audio files. Both for all my tracks : my main storage is tag tracks then i extract it to folder.jpg for each album with Album art tagger addon (near tracks in folder album). No it is jpg. I tried to "save to" image from tag : it result a jpg file. The file in album folder is also a jpeg file. Done. I sent you the link by private message. This album is just an exemple of most of my albums having the same issue : i think i have about half of my entire collection not displaying artwork in MMA (about 500 albums...). I have downloaded the "Maroon 5" folder and everything synced fine here (artwork shown as expected in MMA and Anrdoid's Total Commander). Nevertheless I've tested with 4.1.21.1869 while you were testing with 1867. 1) if you browse the "Maroon 5" via UPnP node, do you see the artwork correctly? If not, go to C:\Users\<user>\AppData\Local\Temp\ and try to delete or clear MM_UPNP_Images folder, does it help? 2) If you try to delete the "Maroon 5" in MMA (including the folder) and sync again (using MMW 4.1.21.1869), are the tracks and artwork loaded correctly? No, i see only some artworks; about 20 over my about 1000 albums ! I deleted the folder (it seems contains only few artworks that i see in Upnp) and browsed again Upnp from MMA : no changes. OK, if you don't see the artwork via UPnP either then it won't be Wi-Fi synced. 2) Generate debug log using the DbgView app (item 4b here viewtopic.php?f=6&t=341 ) while browsing the "Maroon 5" via UPnP node in MMA, I should (hopefully) see in the log why the artwork isn't serving. EDIT: Maybe even better than debug log would be your database (C:\Users\<user>\AppData\Roaming\MediaMonkey\MM.DB ), could you zip it and share the link to it via PM? I''ve revised the code and found that the issue could also happen when the tracks/artworks are located on a temporarily inaccessible network drive. Are they on a network drive? Hi, thanks for the MM.DB. I've entered the issue as https://www.ventismedia.com/mantis/view.php?id=14879 and will fix it for the next realease. EDIT: I've just found that the coverStorage is 0 (file tag) so that's all right that the coverPath is empty. The cover is supposed to be in the file tag. or send me the file for analyzing? It seems that the cover is either not presented in the file tag or cannot be read by MM. EDIT2: The really strange this is that you seem to have every track in your library twice! The first version was added in on 12/21/2013 and the second was added two months ago (04/12/2018), I wonder how the second version could get into library? The path is identical so it couldn't be added by a library re-scan. Maybe an addon? BTW my theory is that the media on which the tracks resides has changed somehow and thus the old tracks (duplicates) are now inaccesible. MM wants to serve arwtwork of the inaccesible copy. To confirm my theory try to locate the Maroon 5 album and delete the no longer accessible copies from the library. I guess it will resolve the issue and artwork will be finally shown over UPnP? I've fixed the issue as https://www.ventismedia.com/mantis/view.php?id=14879 , i.e. so that artwork for the accessible copies is served via UPnP/Wi-Fi. The question is why the duplicates were created, the media must have changed somehow and thus MM now see it as another media for some reason. See the item 3e how to "repair" the situation.